Part of my #Hillary2016 project found here: http://www.nategowdy.com/hillary2016! Thanks again to the campaign for including me and my camera, as well as Tina Podlodowski for hosting and Jason Collins, the NBA's first out player, for being a great guy to chat with! The game is going on right across the way from my studio so I thought I'd wander around for a bit and see what I could see.. and enjoy a hot dog! Randomly encountered a staffer carrying last year's Vince Lombardi Trophy, and on his way to CenturyLink Field. Initially assumed it was a knockoff. Nope! Jealous of my peers who get to be taking snaps from the sidelines. Go Hawks! 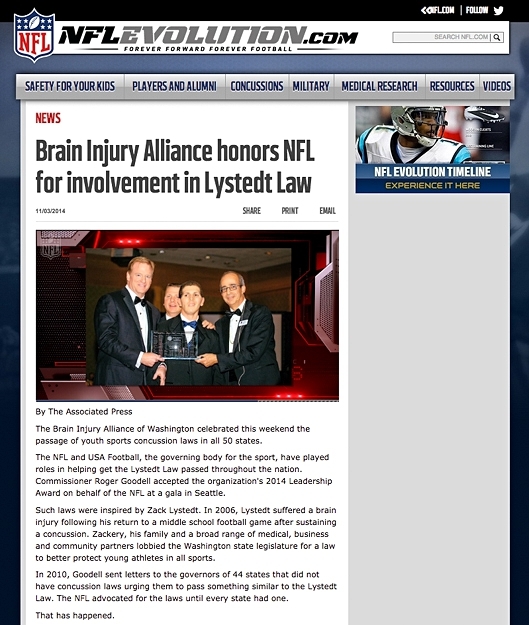 I was surprised the images of National Football League Commissioner Roger Goodell accepting the Brain Injury Alliance of Washington's (BIAWA) 2014 Leadership Award on behalf of the NFL on November 1st weren't picked up anywhere else in the media. Goodell attended the 8th Annual B.I.G. Event (Brain Injury Gala) at the Seattle Westin Hotel in celebration of the passage of youth concussion legislation in all 50 states. Many of these laws were modeled after Washington state's first-in-the-nation "Zackery Lystedt Law". It took many partners to support this momentous health and safety accomplishment, from the Lystedt family who were were willing to share their story, to a small organization like BIAWA that brought together a state-wide coalition. Four years ago, Commissioner Goodell attended BIAWA's 4th Annual Gala and made a commitment to offer the NFL's support and leadership to ensure passage of youth concussion laws throughout the country. Through the NFL's dedication and that of its 32 clubs to advocate before every state legislature, as well as the Goodell's willingness to contact the governor or every state that did not have a law, 44 states adopted laws to protect youth athletes. "The passage of the Lystedt Law in all 50 states is an important step for all young athletes and their parents," Commissioner Goodell said. "The Lystedts, BIAWA and others should rightfully be proud of all that they did to make the nationwide passage a reality. We are honored to support their work to protect all young players, no matter what sport they play. We will continue to focus on making our game better and safer and setting the right example on health and safety in sports." Whenever I find myself with access to individuals who are a big damn deal, my goal for portraits is to get in as close as possible. It's kind of more and more become an obsession in the past year. This past Saturday evening I photographed National Football League Commissioner Roger Goodell and Peter McLoughlin, Seattle Seahawks President and CEO of Vulcan Sports & Entertainment. Both were attending the 8th Annual Brain Injury Gala at The Westin Seattle in celebration of the passage of youth concussion legislation in all 50 states. Many of these laws were modeled after Washington state's first-in-the-nation "Zackery Lystedt Law". From the press release: Four years ago, Commissioner Goodell attended the BIAWA's 4th Annual Gala and made a commitment to offer the NFL's support and leadership to ensure passage of youth concussion laws throughout the country. Through the NFL's dedication and that of the 32 clubs to advocate before every state legislature, and the Commissioner's willingness to contact the governor of every state that did not have a law on the books, every state has now adopted laws to protect youth athletes. My second-shooter Jennifer DeLeo, intern Bob and I had a really stiff model to work with at the Brain Injury Alliance of Washington's 8th Annual Gala. Having the Vince Lombardi trophy in attendance definitely made the event a much different experience than last year's. For the third time in four years, I got to make the trek to Inspire Youth Project's annual summer camp at Lake Wenatchee for a couple days and nights. For the first time, I'm excited to be sharing some images publicly. Every year, Camp Rise n' Shine is one of the things I most look forward to attending. 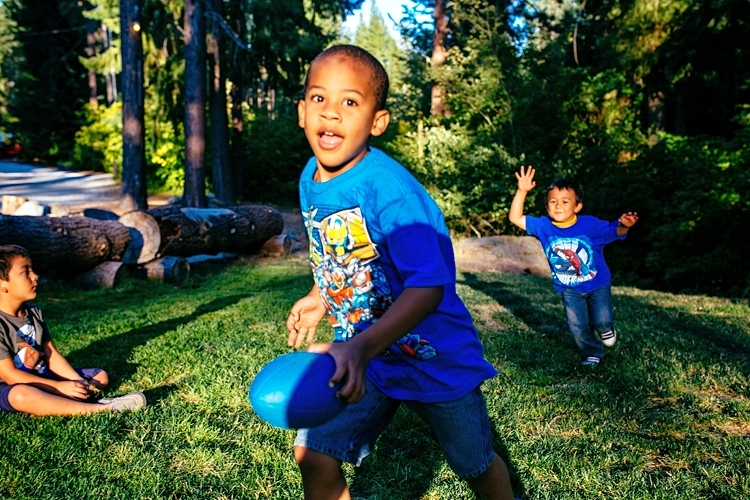 Before getting into photography, I made a living as a preschool teacher, and it's nice being around kids again -- especially these guys, most of whom come from pretty hard home lives and return each year to see their friends from camp. Stay tuned for several more roundups of photos from this year's camp in the next few weeks!